Luxury cruiser manufacturer Maritimo is set to bring a totally new level of style, performance and sophistication to the mid-price range sector of the boating market with its new Mustang 43 Sports Cruiser which will be launched to the public at this months Sanctuary Cove International Boat Show. The sleek new model has already been launched to Maritimo’s dealer network and it has received rave reviews. 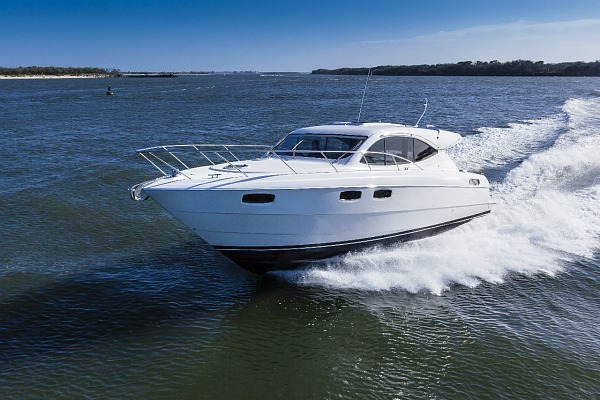 The boat has undergone the most exhaustive research and development process of any of the vessels in the Mustang and Maritimo range, according to management. Maritimo marketing director, Luke Durman said the response from dealers who got to inspect and sea trial the vessel on the Gold Coast last week was extremely positive. Mr Durman said the Mustang 43 had a top speed of 31.5 knots using 128 litres an hour which compared favourably to its closest competitor which had a top speed of 32 knots burning 165 litres an hour. At eight knots it consumes only 14.8 litres an hour versus the competition which uses 24 litres. Initial details on the Mustang 43 were first released at last year’s Sydney International Boat Show, where it attracted considerable attention, and it has since been changed and refined to ensure it ‘ticked all the boxes’. The Mustang 43 will be offered with stern drives as the standard and optional shaft drive or IPS pod drives. Mr Durman said the Mustang 43 Sports Cruiser would be the ideal mid-market vessel sitting between the highly successful and popular Mustang 32 Sports Cruiser and the Mustang 50. “Mustang has a very loyal following and what we have done with these three new models is take the brand back to its roots and deliver high quality, high performance, comfortable and reliable boating options to prospective buyers, be they existing Mustang owners or new purchasers,” said Australian boating industry icon and Maritimo founder Bill Barry-Cotter. Stepping aboard the new Mustang 43 the aft cockpit is set up perfectly for entertaining or relaxing with the family; even the part time fishos will appreciate the cockpit arrangement with the aft facing “L-shaped” lounge and free and clear access around the transom. There are storage lockers in the cockpit and big capacity lazarette storage for the inflatable toys and diving or fishing gear. On entrance to the saloon there is the fully equipped aft galley to starboard conveniently positioned behind the entertainment unit. The helm sits forward starboard with great 360 degree visibility. A ‘pop-up’ window separating the aft galley and the cockpit on the starboard side opens up the interior to sea breeze and provides seamless connectivity between the galley and the cockpit lounge. “We wanted the galley connected with the L-shaped lounge area in the cockpit, which is under the shade of the hard top, so that the users can all interact and remain connected no matter what they are doing on the vessel,” said Mr Durman. Accommodation is luxurious and abundant when you step down from the main saloon area. To port there is a large VIP cabin with a full sized double berth and a cleverly designed lounge running along the port side of the vessel which adapts to a double bunk, Pullman style, easily accommodating two children. Forward is the owner’s stateroom with a walk around island double berth, plenty of natural light through hatches and portholes and ample storage. To starboard is an extremely generous bathroom with a large enclosed shower, vanity and hand basin and electric toilet. Again portholes and hatches provide abundant natural light and fresh air.